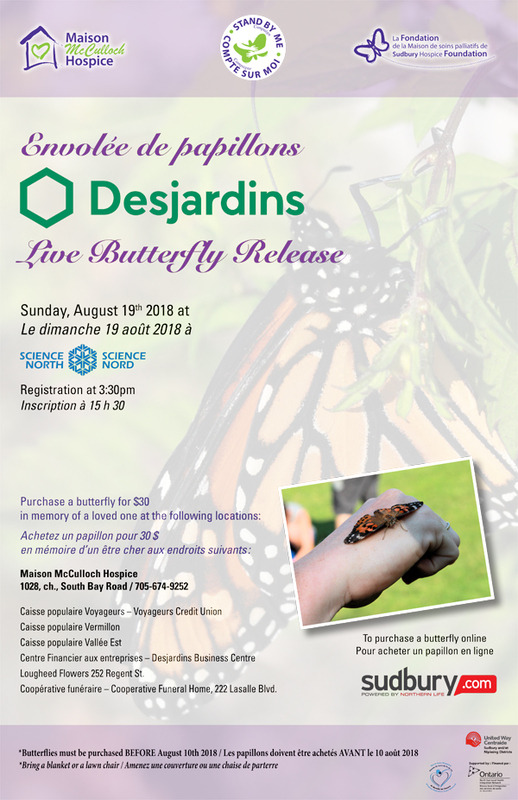 Maison McCulloch Hospice invites you to the Live Butterfly Release which is held annually at Science North in front of the Rusty Blakey Monument. Come join us for this unique opportunity to celebrate the life of a loved one by releasing a butterfly in their honour or memory. Butterflies are the acknowledgement of a life lived and a multicultural symbol of change, transformation and the beauty of nature. Their release signifies freedom and encourages those left behind to take another step in the healing process. All funds will benefit the programs and services of Maison McCulloch Hospice. For more information, please give Ashley, our Public Relations and Events Coordinator at the Maison McCulloch Hospice a call at 705-674-9252 ext 228 should you have any questions! Thank you to our event sponsors for their continued support! 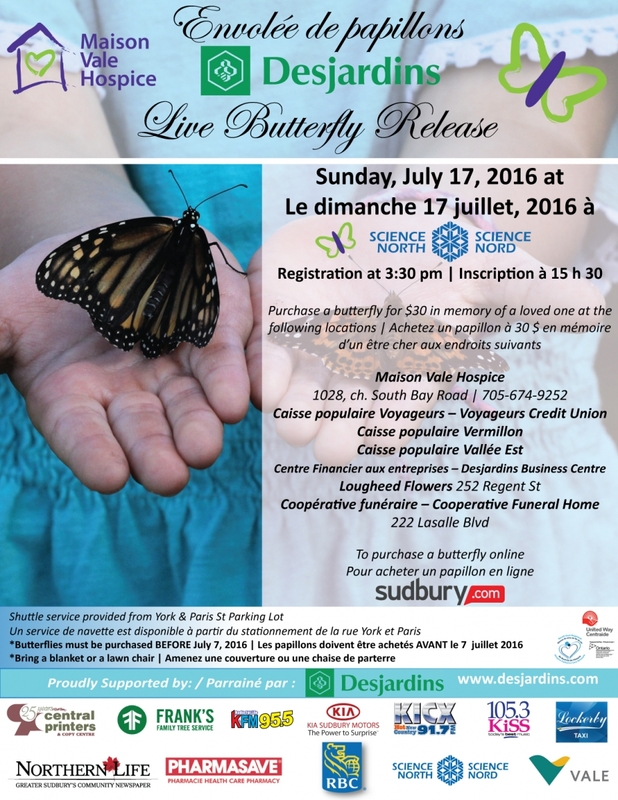 Maison Vale Hospice invites you to the 2016 Desjardins Live Butterfly Release which will be held on Sunday, July 17, 2016 at 3:30 pm at Science North in front of the Rusty Blakey Monument. 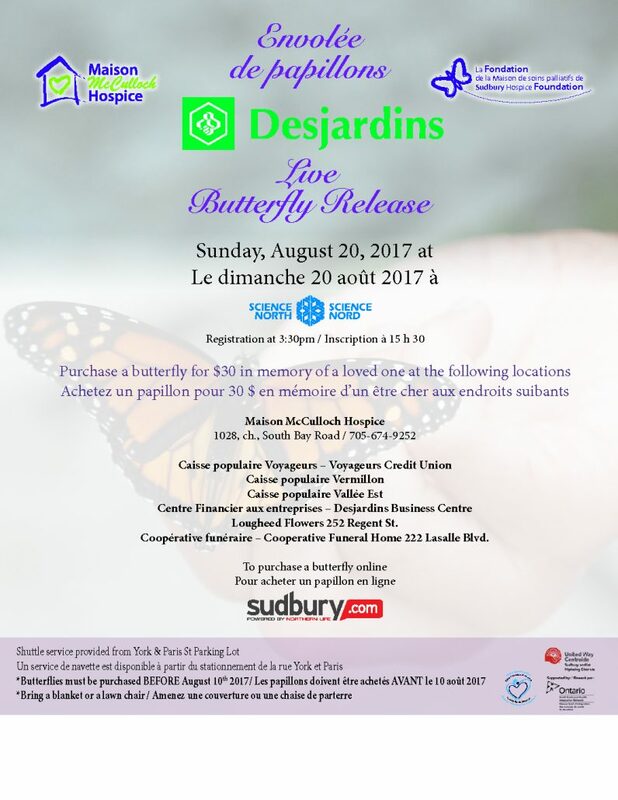 Come join us for this unique opportunity to celebrate the life of a loved one by releasing a butterfly in their honour or memory. Butterflies are the acknowledgement of a life lived and a multicultural symbol of change, transformation and the beauty of nature. Their release signifies freedom and encourages those left behind to take another step in the healing process. All funds will benefit the programs and services of Maison Vale Hospice. Please give Larissa, our Public Relations and Events Coordinator at the Maison Vale Hospice a call at 705-674-9252 ext 228 should you have any questions! Hope you can join us!